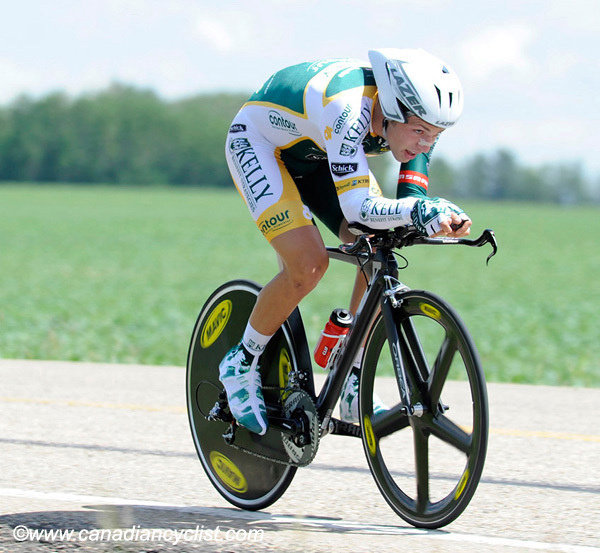 Young Canadian pro David Veilleux has announced that he will leave the American team Kelly Benefit Strategies to make the step up to the Pro Continental French squad Europcar for 2011. Team Europcar for the 2011 season: a new step in my career. I am pleased to announce that I will join the French team Europcar for the 2011 season. I will therefore race at the highest level of my sport and have the chance to ride with experienced riders such as Thomas Voeckler, winner of the Grand Prix of Quebec and a stage to the Tour de France in 2010, and Anthony Charteau, polka dot jersey winner at the 2010 Tour de France. This move to a European team at the international level represents a childhood dream, but also a reward for all these years of hard work and sacrifice. I would like to take the opportunity to thank my team of the last three years, Kelly Benefit Strategies. My experience with this team enabled me to progress greatly with the advices of the sporting director Jonas Carney and all of my teammates. I really appreciated to race with these guys. Europcar has been a professional team established for several years. Thus, its calendar of racing will be filled with the most prestigious events in the world. Obviously, I do not expect to take part in the Tour de France during the next season. My goal will be mainly to learn and to get used to the rhythm of races. I aim at giving my best so that the team obtains good results. I will see during the course of the season how things will go, but it is certain that I will target the Canadian national championship in the time-trial and on road. For the moment I don't know yet my calendar for the season, since my team is waiting to hear from the organizers concerning invitations. On the other hand, I know that at the beginning of season they will include me in the group of 10 riders that will take part in the Classics, but without knowing exactly which races I will do. I am very glad to be able to join a team of this international level because it will allow me to continue my development. Moreover, knowing that I will do it with clothing and helmets from Garneau gives me confidence knowing that my equipment will be among the most technological in the industry. My association with Garneau goes back to my very beginnings in the sport, when I was 15 years old. It is a great family that I return to and I will be pleased to provide the company with my experience to help them develop excellent products. I thus will continue to inform you of my competitions by the means of my website, thanks to Alex Coulombe Ltée. Soon, I will take part in my first training camp in Spain from December 10th to the 17th, then another one from January 6th to the 13th before attending my team presentation on January 14th, in Paris. Looking forward to tell you about my first race with the team.